After the events of the Summer Sun Celebration, Starlight, now an Alicorn, must learn what her new responsibilities mean for her and her life. AU: Everything that happened after The Cutie Map Part 1 was actually part of Starlight's troubled dreams. Now, she needs to set things right. Starlight Glimmer, after spending Hearth's Warming in Ponyville, goes to the Crystal Empire to spend the New Year with her old friend, Sunburst, for whom she has also secretly has feelings. Can she tell him how she feels? The three Alicorns of the old days must choose successors to pass on their Alicorn magic. But are the chosen few ready to accept the burden of a country? A what if exploring what Equestria might be like if Celestia and Luna had changed in different ways. Twilight Sparkle invites a bunch of her friends over to a slumber party… No, not that group of friends… The ones who’ve maybe dabbled in some light conquering or wholesale destruction of planets. A Thanksgiving tale about Tempest and Twilight, and another side about Trixie and Starlight. Short, sweet, and romantic. Happy Thanksgiving, everypony. Now reformed, Tempest Shadow experiences one of the most challenging moments of her life: a friendship group. All Starlight Glimmer has to do is foalsit Flurry Heart for one night. What could go wrong? Starlight Glimmer wants to fly kites, but the weather is not scheduled for anything conducive to kite flying. Things go awry because the name 'Starlight Glimmer' is in that sentence. (Takes place after "Rock Solid Friendship".) After Trixie accidentally infects Starlight with poison joke, Starlight becomes fed up with Trixie's inability to listen and threatens to break off their friendship. Maud and Twilight try to prevent this. Tis not all that glorious. The pets and their owners have swapped roles, making them ponies and their masters pets. 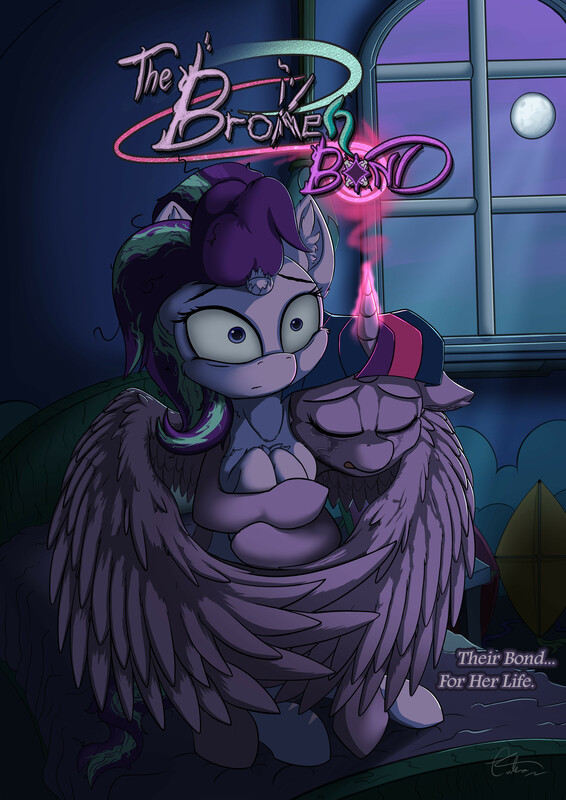 Now the Sidekicks must travel across Equestria, go on the adventure of a lifetime, and discover their inner hero. Are they up to the task? The rulers of the Universe drop by for a little visit. Seath, a wounded, scaleless, partially-insane dragon, has trouble opening up to the kind and loving Fluttershy. The wisecracking Lannister Imp chews the fat with our favorite level-headed princess. After he helps her out on the farm, Apple Bloom forms a crush on Spike. Cute, right? Only problem: Spike doesn't want anything to do with her. What happens when Twilight Sparkle embraces the darkness? Definitely want to see where this goes. Its off to a great start! I....I....I NEED TO READ MORE! SOON PLEASE! Well, did you read it yet? Yes, but I haven’t played the Witcher 3 nor do I know anything about G1 MLP. The author's note at the end? Dear lord... don't stop this. I always wanted to see a real scary witch in a story. So... it seems like she traded Twilight's health for her own. ...At least, that's what the first chapter states in my opinion. I absolutely love this premise, it just seems so Faustian to me. Dude, my heart started to seize up when I was reading the description of the witches in conjunction with the music playing. I was legitimately scared at the time. Well, I'm intrigued. I hope there's more to this story. So twilight is alive and starlights price is never knowing that? Twilight is okay, Starlight found out about that, so the Witches met their end of the bargain and it was time for Starlight to meet her's. i'd have thought spike would have gone with her, just as back up. i didn't care for the ending, seemed abrupt. It was abrupt! Yes, but that's how it's meant to be. Starlight was at least thinking she'd be able to see Twilight, but all of that went out the window when she completely locked up realizing that the prophecy foretold actually was coming to pass. Also, Featured! Oh my Gosh! She traded her magic, didn't she? The teacher feels responsible, shouldering all the burdens that come with it, while Starlight's soul deteriorates with conflicting feelings . I hope this story meets your expectations in the future. Glad to hear you liked the start! Ask and ye shall receive... in hopefully a week! Preferably less. Semester's almost over, thankfully. So I'll have plenty of time to write - both this, and my other stories (on FF.net). I hope I delivered in that regard. I don't know if you read my author's note and know why I made the Witches the way they are, but my main priority was nailing the same unsettling eeriness which plagued the Crones of Crookback Bog's main scene in Witcher 3: Wild Hunt. I'm really glad to hear that! The music was what made that particular scene so unforgettable in Witcher 3, and I'm happy to hear someone's experience was enhanced by its inclusion. Thanks for the follows, friends! I hope I don't disappoint. Waiting eagerly! Seriously though i just realized i was imagining the witches in Mike Mignola's art style and I can't give a bigger compliment than that. *looks up* Damn that's badass! Great start. I just hope it doesn't end in the dark cause that's not the vibe I'm getting. What do you mean by "end in the dark"? The story is obviously framed so that "things go bad for Starlight" but how a story progresses and how a story ends can be two different things. Oh dear, I do hope you don't allow that mentality to color your perception of the narrative! Yes - this story is definitely a rough go for Starlight Glimmer. But I'm not doing that out of some malicious hatred of her, I'm doing it because this scenario makes sense for her character: she makes thoughtless decisions which would only impact the present, without any thought for the future. And to save someone as important to her as Twilight, it only further fuels this irresponsible behavior. It was always going to bite her at some point - just going with her gut. And although she has once again achieved success, it will come at the cost of something dear to Starlight. How do I know this story won't die after only one chapter? Not at all I try to keep an open mind. But... well. For now I'll just wait and see. How's progress on the new chapter? It's half written. Should ideally be done and posted by the end of the week, if not sooner. Seriously, the music turns that whole scene with the Witches from something "merely" unnerving and unsettling, into something bordering on downright terrifying. Loved it. Definitely looking forward for more! That's exactly what I hoped to achieve with the music! I'm glad you liked it. I coulda swore the witches left without taking anything. Oh well, we can love our ponies, but we can’t save them. Damn. Getting Fizzlepop Berrytwist vibes here. Once upon a time, I would’ve sworn that Starlight would get another chance. A way to get back what she lost. Now, after the movie, the answer is no. I’m very curious as to how this is going to affect her. Also, did those damn witches change the book on purpose? I feel like they would do that specifically to mess with Starlight. Yay new update! *reads update* Yay my heart has been punched! Exactly like I wanted! Emotional masochism is magic friends! Seriously good chapter. Can't wait for more! Wonder If Fizzy might make an appearance here maybe help starlight through this a bit? Why is Starlight crying? IT WAS WORTH IT. Twilight is ALIVE. I dunno it might have something to do with her HORN BEING RIPPED OFF.